Happy Fourth Sunday of Advent, which happens to land on Christmas Eve this year! Before I launch into posting tons of pictures of the Nativity and sweet Holy Family pictures (which is totally going to happen once we officially hit the Christmas season, make no mistake!) I figured that I would highlight one of my absolute favorite pictures of the Annunciation. The Annunciation, by Pedro Berruguete, c. 14th century. Miraflores Charterhouse, Burgos, Spain. Honestly, I adore this picture so much. There’s the vibrant colors, of course. Then the way the Holy Spirit, depicted as a dove, seems to be launching itself toward Mary in enthusiasm. The way Gabriel’s facial expression seems to contain both hopeful expectation, yet restraint at the same time, as if he were holding his breath. The peaceful look on Mary’s face as she accepts the message with her Fiat. It’s just a gorgeously made painting! But one of the things that I especially love is the figures that seem to frame the image. On the top shelves stand Adam and Eve. Then, underneath them, are all the rest of the patriarchs and prophets who have foretold this event and have longed for this God to come and walk among them. For the past weeks, concluding finally with today’s scripture readings, we have been going through the prophecies of the Old Testament, where the prophets and patriarchs long for God to dwell with them and establish His covenant with them. And, in the Annunciation, the prophecies and everything are fulfilled. God will come to dwell among us. And through Christ, we may join His Covenant and become part of His family. Anyway, I hope you all have a blessed Christmas! What was the first thing that you noticed from the picture? Look at the facial expressions of both the angel, Gabriel, and Mary. What do you imagine they’re thinking through this scene? The room is deliberately painted to look open and airy, as if it seems to stretch on for eternity, so as to keep our mind focused on eternity. 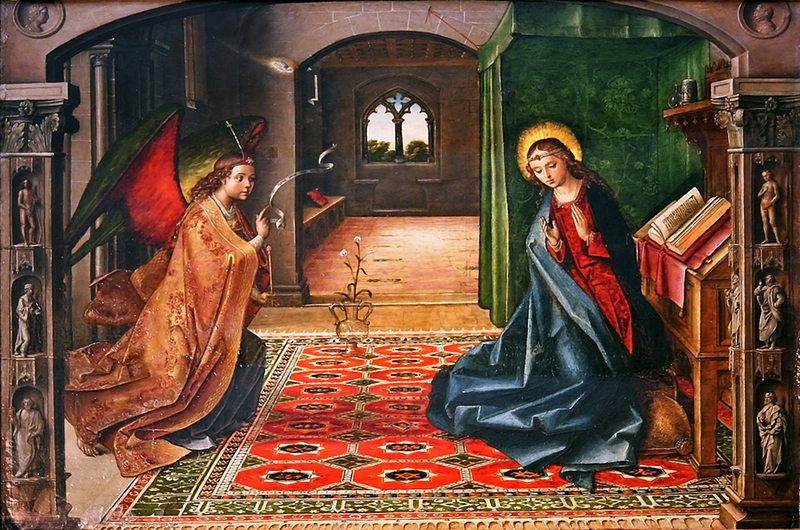 What lessons from the Annunciation can we pick up from this pivotal moment? Help us eagerly await Christmas with the same hope and expectation that our ancestors of old did. As you might expect! I totally included this picture in my new book, The Joyful Mysteries. Take a peek at it here!